WikiLeaks founder Julian Assange arrives in a police vehicle at Westminster Magistrates court on Thursday in London. He was arrested by Scotland Yard police officers inside the Ecuadorian Embassy in Central London. Not only did Ecuador withdraw protection for Assange, according to wire service reports, the government has arrested a person who is allegedly close to WikiLeaks. Reuters quotes Interior Minister Maria Paula Romo as saying the person was picked up in Ecuador while trying to travel to Japan. British authorities have received a request to extradite Assange, they said. He is expected to appear at a hearing on May 2. Justice Department investigators have described the key role that they say Assange and WikiLeaks played in the Russian attack on the 2016 election, but the charges announced on Thursday allude to an earlier chapter in his long-running drama. Manning was tried and convicted for the role she played in releasing U.S. government secrets to WikiLeaks; she served more than six years in prison before her sentence was commuted by President Barack Obama. More recently, Manning was ordered into custody again after a judge found her in contempt of court. Manning reportedly refused to give evidence to a federal grand jury in the Eastern District of Virginia in a case also connected to Assange. 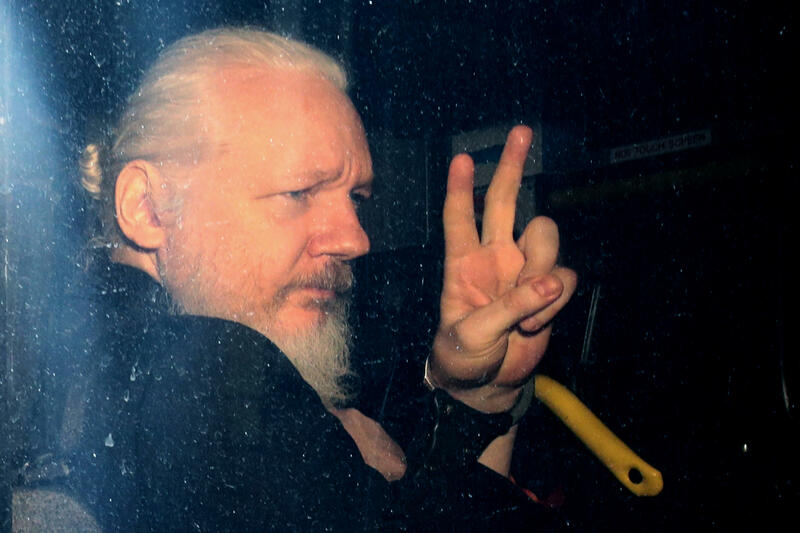 It wasn't clear whether the revelations about the existence of that grand jury proceeding could mean there is another indictment in store for Assange. The one unsealed against him was dated March 6, 2018. Manning's attorneys said on Thursday that the Justice Department's ability to file the charges showed it didn't need her to provide evidence and demanded that she be released. "Grand juries may not be used for the sole and dominant purpose of preparing for trial, including questioning potential trial witnesses. Since her testimony can no longer contribute to a grand jury investigation, Chelsea's ongoing detention can no longer be seriously alleged to constitute an attempt to coerce her testimony," said lawyers Moira Meltzer-Cohen, Vincent Ward, Chris Leibig and Sandra Freeman. There had been suggestions in the past that a case against Assange was in the works. The Justice Department said it did not plan to release any additional information about Assange on Thursday. President Trump, who professed his love for WikiLeaks during the 2016 campaign when it revealed material that embarrassed Democrats, said at the White House on Thursday that he didn't have any knowledge about the charges against Assange. "It's not my thing," the president said. What happens next is up to Attorney General William Barr, Trump said. Assange had been holed up at the embassy in London since 2012, after Ecuador granted him asylum to avoid extradition to Sweden in connection with sexual misconduct allegations. One of the Swedish cases against Assange expired, but another may still pose a legal threat to him. British authorities respected the customs associated with the privileges each nation affords to another's diplomatic facilities and did not venture inside to arrest him. 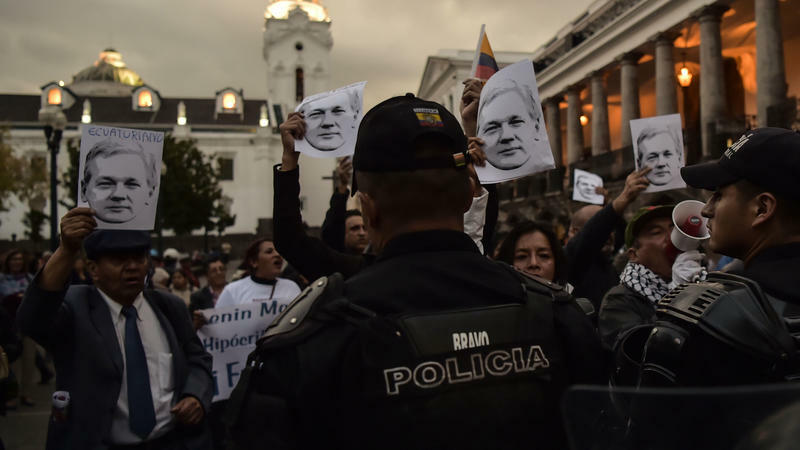 That changed on Thursday when Ecuador's ambassador said that Quito had revoked its asylum for Assange. Metropolitan Police officers could go in to serve their warrant. When they came back out, video footage appeared to show them carrying a bearded Assange to a police vehicle. Last week, people gathered outside the embassy after WikiLeaks announced that Assange might be "expelled" from the building within "hours to days." On the day of Assange's arrest, WikiLeaks pleaded for his protection, tweeting that "Powerful actors, including CIA, are engaged in a sophisticated effort to dehumanise, delegitimize and imprison him." Ecuadorian President Lenín Moreno described the government's decision to withdraw his asylum, describing his "aggressive behavior." 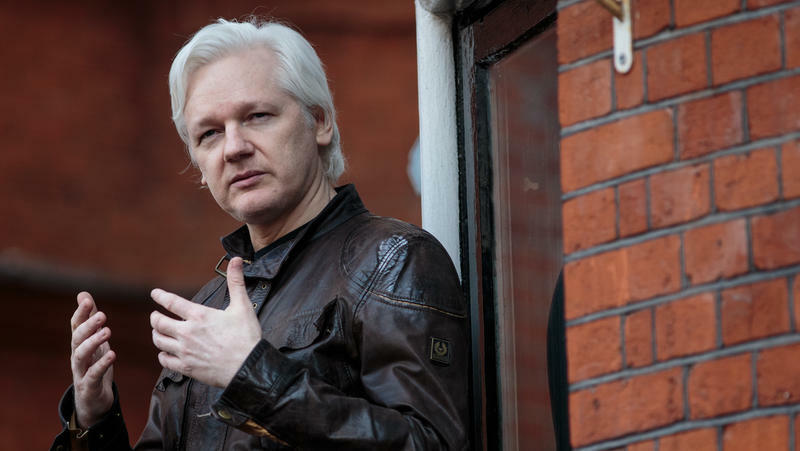 Moreno accused Assange of installing prohibited electronic and distortion equipment, blocking security cameras, mistreating guards, accessing embassy files and threatening the Ecuadorian government. He also said Assange had intervened in international affairs by working with WikiLeaks to publish leaked Vatican documents. In Moscow, Vladimir Putin's spokesman, Dmitry Peskov, expressed hopes that "all his rights will be respected." Russia's military intelligence agency, the GRU, gave Assange data it stole in cyberattacks in 2016 so that he could release it as part of Russia's interference in the presidential election, prosecutors say. Assange also once hosted a talk show on Russia's state-backed media network RT. WikiLeaks first gained notoriety in 2010 when it began to release troves of U.S. government secrets about the wars in Iraq and Afghanistan and Washington's conduct of diplomacy around the world. The files also revealed the identities of people who had worked with Americans in Iraq and Afghanistan, leading officials to warn their lives may have been put in danger. Assange and his supporters have long maintained that he is a journalist and that WikiLeaks is a news organization like those protected by the First Amendment and other free-press laws around the world. Assange's revelations about the conduct of the wars in Iraq and Afghanistan, the internal discussions within the State Department and other such matters amount to journalism and accordingly he has never committed any crime, boosters argue. While the indictment against Julian Assange disclosed today charges a conspiracy to commit computer crimes, the factual allegations against Mr. Assange boil down to encouraging a source to provide him information and taking efforts to protect the identity of that source. Journalists around the world should be deeply troubled by these unprecedented criminal charges. Prosecutors' choice to focus their case on the alleged cyberattack suggests the Justice Department's case against Assange may depend less on questions about journalism or reportage and more on the technical aspects of what happened. Critics argue that any claim Assange could make to being a journalist has been voided by the work he did serving as an arm of Russia's "active measures." Sen. Mark Warner, D-Va., the vice chairman of the Senate intelligence committee, said Assange is overdue for a reckoning in an American court. Julian Assange has long professed high ideals and moral superiority. Unfortunately, whatever his intentions when he started WikiLeaks, what he's really become is a direct participant in Russian efforts to undermine the West and a dedicated accomplice in efforts to undermine American security. It is my hope that the British courts will quickly transfer him to U.S. custody so he can finally get the justice he deserves. Assange's trial may answer many other questions about the other chapters in his story. For example, in January 2019 the Justice Department announced charges against GOP political consultant Roger Stone connected with what authorities called work by him and others as alleged intermediaries between WikiLeaks and Donald Trump's 2016 presidential campaign. Stone has pleaded not guilty to the charges, including lying to Congress and obstructing its investigation. Stone says he hasn't done anything wrong. Stone's trial and Assange's eventual trial may reveal more about the nature of the contacts they and others carried on in 2016. All the same, Attorney General Barr has said that special counsel Robert Mueller has not established there was a conspiracy between Trump's campaign and the Russians who interfered in the election. Washington and the world are waiting to learn more from a redacted copy of Mueller's full report, which is expected next week. NPR reporter James Doubek contributed to this report.